These are both 6 string versions and the 330 was built in 2007 and the 360 in 2008. The 330 was bought new and the 360 was a year old. This paragraph describes both guitars and lists the physical differences. The 330 is the basic of the two models with a symmetrical unbound body, dot markers on an unbound neck and one mono output. The 360 has a softer body shape, rear bound body, bound neck and triangular markers with dual or stereo outputs. The stereo output only works with a non supplied breakout box. Both guitars are made extremely well and the paint finish has no 'orange peel'. 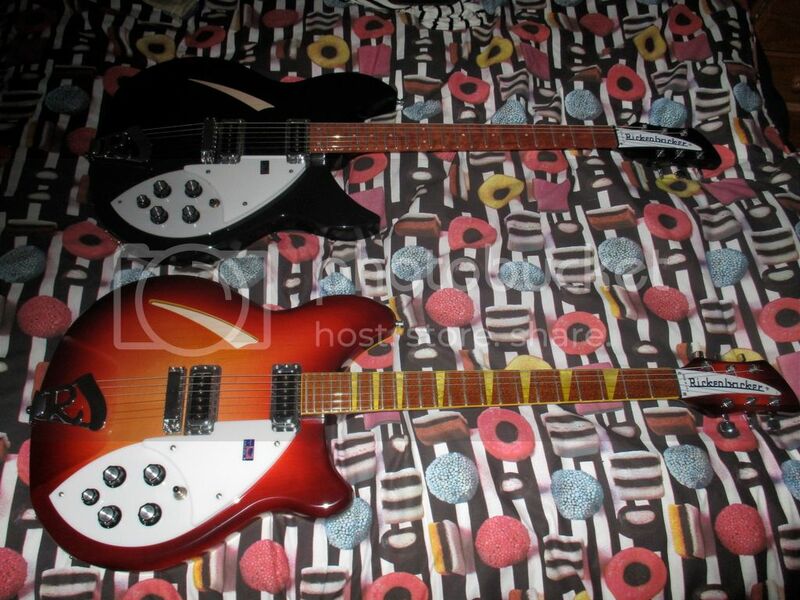 Both guitars play really well but have a twin truss rod arrangement which is best left to an experienced Rickenbacker technician. The company support the product with a website and forum in which CEO John Hall often answers questions. After nearly 10 years of ownership the guitars are still stock and have been used at home, rehearsal and in live situations. Both instruments have been played at home in an AB situation using a Matchless Lightning head and a split open/theile cab with both alnico and ceramic speakers. Drive pedals used were a Klon, Fulldrive 2 and Fuzz Factory. The clean sounds with a Vox type amp obviously have that clean jangle and the drive sounds are good with 'edge' 'tubescreamer' and 'crazy' oprions from the 3 pedals. 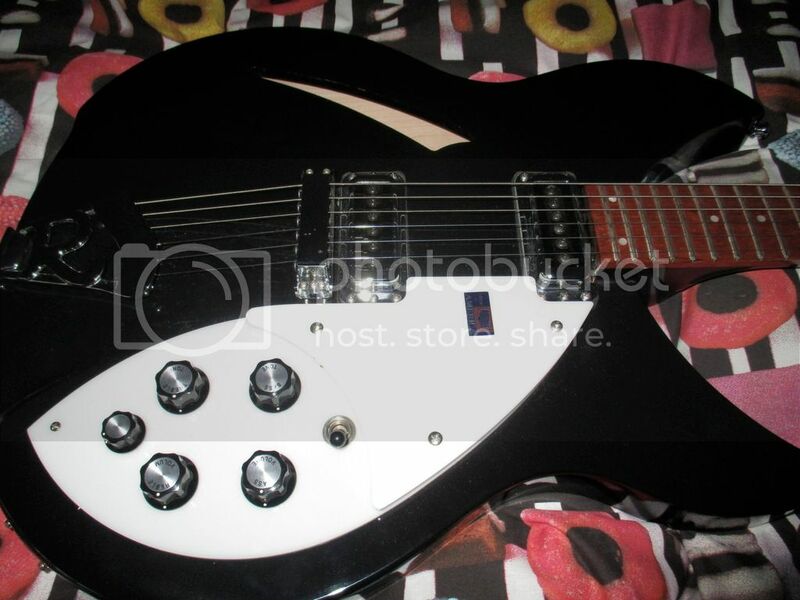 Rickenbackers are not an obvious choice for gain. Personal preference is that if the clean sound dominates the application then a Ric is the best choice. If dirt is more important, a Les Paul is subjectively a better fit. If one needs authentic sounds for Beatles, Byrds, Petty, Jam Smiths etc then a Ric will easily get one there. With the AB test using a sound eg clean and swapping back and forth the 360 is better clean and the 330 better driven. There's not a lot in it but when AB'd is noticeable. I've often taken the 330 out simply because it has a tiny ding in the body and the 360 is mint. I'm not sure if the difference is down to body shape/mass or between guitars. I've played a few Rics and never played a bad one and they always sound as expected. The neck is fairly thin and causes problems to some people. Personal philosophy is that if one wants the Ric sound, one learns to love the neck dimensions. 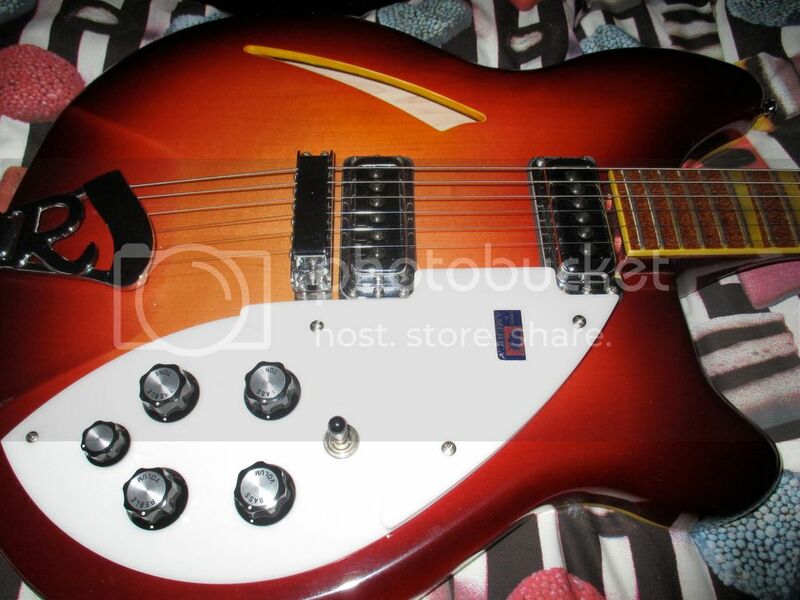 The biggest problem with Rickenbackers is the price. The company will not use offshore manufacturing or licensed copies. Their business model allows them to make a profit producing less volume than the demand. In the last recession they simply caught up with the back log and put the prices up. They will not get cheaper. Why do I love/hate it enough to write a review. My main guitar is a Les Paul. I've thought about trading one or both of these guitars a number of times and I cant do it. Playing both of them today reminds me how good they are. This is a very quick and very dirty soundfile Ric 360 Matchless Klon and FD2 for dirt. It should give you an idea of the sound and more importantly how a Ric sounds with a TS overdrive at home volume. It is not even songwriting demo quality just so you know. I'm really not happy with the soundfile, I keep looking at this thread to see if anyone thinks it crap. I'll add a better quality soundfile soon. Great review and insight into owning a Ricky... They remain a guitar full of character ! Thanks. They have a certain something. The control layout on both guitars is volume and tone for each pickup and a 5th knob. This is blend or balance for the neck pickup. I'm not actually sure what it does and neither did George. So the easiest explanation is what it does. With both pickups on and the 5th knob on min the neck pickup dominates the sound. Adding the 5th knob increases the treble. This is all on the mid position or both pickups on. So you can set the 5th knob in the middle and have three sounds, jangly, less jangly and bassy lead. Or you can use it how I do which is to have both pickups on all the time and ride the 5th knob for the sound you want at any given time. I'm getting annoyed with the 5th knob... I'm seriously considering making mine into master volumes. The 5th knob is actually very simple - just an extra volume control for the neck pickup, although it doesn't work in quite a normal way - when the control is all the way down, the neck pickup is full volume. When it's all the way up, the neck pickup is half volume. So when both pickups are on, because the neck pickup is slightly naturally louder than the bridge, the 5th control will sweep from mostly-neck to mostly-bridge. I love Rickenbackers, they just fit me really well for some reason, although I can see they're not for everyone. I even like them for heavy distortion. I do also tend to use them with both pickups on and use the 5th knob to adjust the sound - I also use the stereo outputs, which are really worth exploring if you have two amps (or two independent channels on the same amp) or a small PA or something. I use the bridge pickup through standard guitar effects including overdrive mixed with the neck pickup clean and DI'd to give a sort of 'electric/acoustic' sound which almost sounds like two guitars playing at the same time.